…there are 3 branches, all laid out with the motion tracker layout. We’re going to use the RGB LEDs to do a blue “pulse” through the inserts to simulate the tracking, maybe just for the attract mode or something, should be cool looking. Each branch has 4 modes or multiballs, and then a wizard mode. You pick your film to start the game, and then you need to finish the 4 modes for that film (just start them, not complete) and the wizard mode before you can move on to the other film. Some things will stack, but this isn’t a big stacking game, the modes are about atmosphere and the film, so they won’t all jumble together. The Weyland Yutani inserts are the inlanes, and you need to light both to qualify the mode shot. Directly above those is the space for the color LCD screen, placing it higher up on the playfield than their their first game, Full Throttle. Alien Pinball is slated to launch later this year What are your thoughts on this new art? 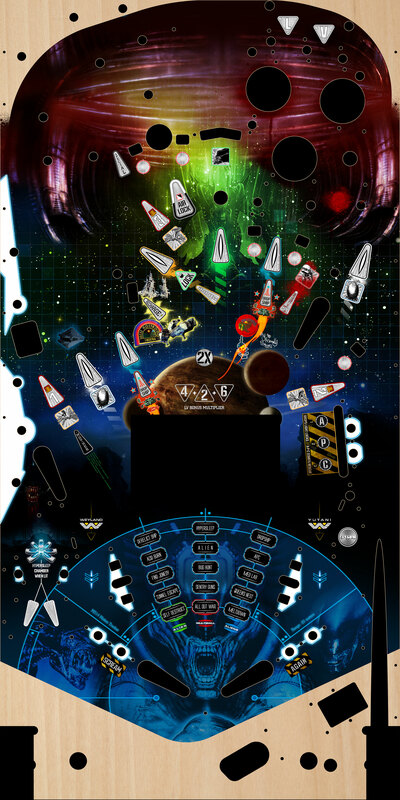 Why do most pinball manufacturers today go for the “We took 15 minutes photoshopping this playfield together”-look? And yes, Bally was sued by Fox for essentially ripping off Giger’s art. I was hoping they’d create some H.R. Gieger-style artwork for the playfield, instead of the typical “drag and drop” method they’re using today of creating playfield artwork.